Directed and produced by acclaimed filmmaker Margy Kinmonth, Revolution – New Art for a New World is a bold and exciting feature documentary that encapsulates a momentous period in the history of Russia and the Russian Avant-Garde. Revolution brings to life the artists of the Russian Avant-Garde by drawing on the collections of major Russian institutions, including rare unseen 100 year old archive footage from the Russian film vaults. Also featured are contributions from contemporary artists, curators, performers and personal testimony from the descendants of those involved, many of which have never been filmed before. A blaze of colour and incendiary imagination, Revolution: New Art for a New World unlocks a visual parade. Charting the Russian avant-garde movement, the documentary spans a period of fifteen years in the wake of one of the twentieth century’s greatest revolutions. In 2017, a hundred years on from the action, Margy Kinmonth’s latest feature documents the radical energy and ambition born of the Bolshevik Revolution. 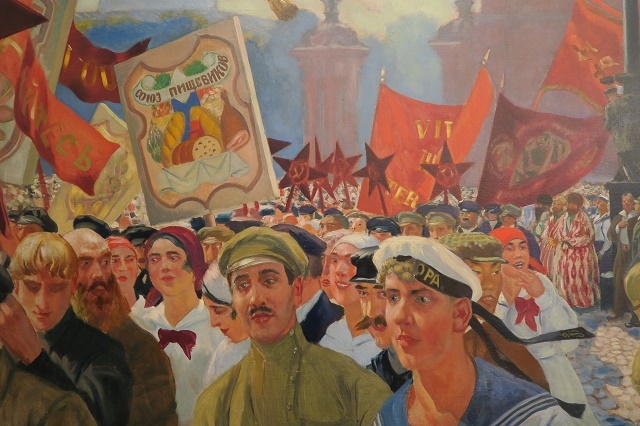 Shot on location in Moscow and St. Petersburg, it rewinds the action to 1917 and the red tide rhetoric of Lenin, chiming with a visual manifesto of artistic rebirth throughout the art world. Centralising the art in the revolutionary movement of people, the film articulates the fervour with which the young movement broke with the figurative landscape in the early decades of the twentieth century. Shredding the narrative of the past, Kinmonth takes as her subject the break of ordered surfaces and aristocratic gentility into an unchartered palette of abstraction. Narrating her personal journey through the art worlds of Moscow and St. Petersburg, the film seeks to address the origins of an artistic period that like much in the Stalinist era, became shrouded in suspicion and subject to censorship and erasure. The film offers a portrait of moving pictures. 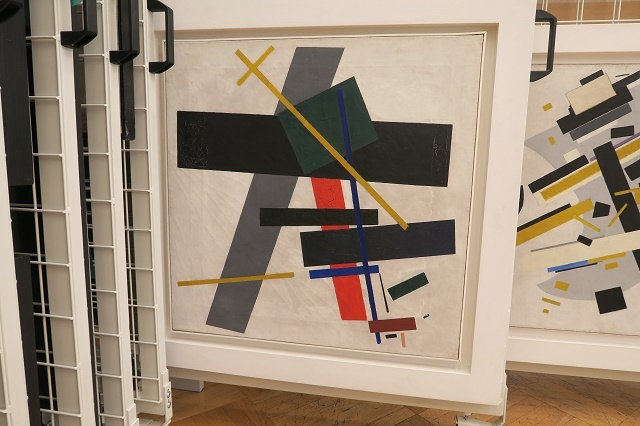 Kazimir Malevich, Wassily Kandinsky, Marc Chagall and those working to shape the avant-garde movement are brought into focus – the exiles, the silenced and those later sentenced to the gulags- they’re the names that helped to extend the definition of modernity and art. 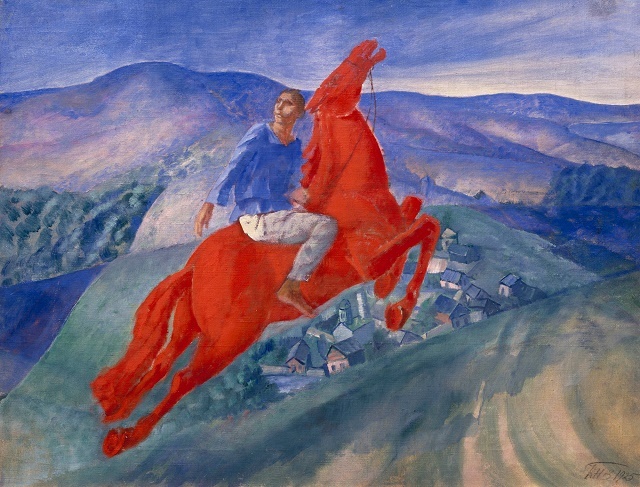 Born within the institutions of Russian theatre, film, documentary and painting the avant-garde group constructed a new era, illustrating the concept of revolution on the canvas. Kinmonth combines rare archive footage to show the avant-garde trains traversing the length of Russia, with interviews from the present. Featuring Russia’s gallerists with the keys to the archives at the State Russia Museum, State Hermitage Museum, and State Tretyakov Gallery, Kinmonth simultaneously pursues the testimony of the children and grandchildren of the artists, many of whom are artists themselves, showing the imprint of the avant-garde on contemporary Russia. Revolution struggles to keep pace with the intensity of purpose of its subject. It lags at times, and the dramatised re-creations don’t add much to the narrative. Yet the film proposes an informative and engaging interrogation of the past, and the fifteen years that shaped a modern movement. Voiced by a starry cast featuring Matthew Macfadyen as Lenin, Eleanor Tomlinson and Tom Hollander among others, its narrative is persuasive and bursting with detail. Poised at a timely moment, the film recounts the shifting tides of politics and power and re-examines the public role that art plays in the modern world. This entry was posted on April 3, 2017, 9:46 pm and is filed under FILM REVIEW, FILM REVIEW. You can follow any responses to this entry through RSS 2.0. You can leave a response, or trackback from your own site.